Color psychology is the study of how different colors represent different emotions and ideas in the mind of viewers. Each color tends to be viewed in a different light and as important in varying ways, and understanding exactly how color psychology works can assist your business in designing the perfect website to get the most out of your online marketing. Not all colors are positive, meaning that it can be very wise to avoid the use of certain choices or combinations depending on what type of mood or message you wish to establish with your site. By understanding color psychology you can avoid possible pitfalls and mistakes that come with randomly selecting colors without using any sort of serious pattern. Color Psychology Described For the sake of this color psychology essay we’ll be focusing on the most often-used colors. These are the ones that you will most likely see on a website, and are significant in addition to this fact because they consist of the primary colors we are all used to working with. For the purpose of this color psychology essay, shades are not included (for example, the difference between light and dark blue). When designing your website with color psychology in mind, be sure to consider the meanings of each of the following and how they relate to one another and the overall message you are trying to get across to your readers: Red – Red is an extreme and emotionally intense color. It evokes aggressiveness, passion, strength and vitality. 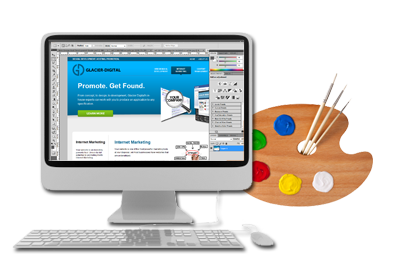 It also grabs attention of the viewers which results in it being used in many logos and company emblems. Red is a strong color to work with, but be sure not to overdue it. Red is best used when combined with other colors. Blue – Blue evokes authority, dignity, security and faithfulness. It is one of the most popular colors among logos and can be seen extensively in education, medical and government logos. Because blue is also calming, it is suitable to use it as a background for your entire site. It will be easy on the eyes of your viewers, meaning that over-use is not really an issue. Green – Green is a calming, refreshing and conservative color. It signifies tranquility, nature, health, and freshness. It is widely used in healthcare, construction, golf and real estate logos due to its relevance with the mentioned businesses. This is another safe choice for website backgrounds due to its general ease on the eyes of readers. When considering color psychology, keeping in mind the ease of viewing is very important. Yellow – While it is considered as an optimistic color, yellow is the most difficult color for the eye to take in. On the other hand, yellow color symbolizes positivity and buoyancy. But its use should be minimal as it can be overpowering if overused. It is best to use Yellow on a dark background or combined with other colors to highlight it. One of the fundamentals of color psychology is to avoid offending the eyes of your readers! Purple – The color of royalty, purple connotes luxury, wealth, spirituality and sophistication. It also symbolizes rank and authority. However, because it is rare in nature, purple is rarely used in logos. Because of this, it might be wise to consider using it to give you a creative advantage. At the very least, the color psychology here implies that using a royal color can give the impression of power and significance to your site. Orange – Orange represents energy, enthusiasm, flamboyance and demand of attention. This particular vivid color is common among the logos that offer sense of openness and friendliness to their viewers. Its attractive, bright and cheery nature captures the attention of the spectators and gives your logo a contemporary look. Pink – The color pink induces femininity, innocence, softness and health. Due to its tranquilizing nature, pink is extensively used in logos related to spa, health care and cosmetic products. Brown – Brown suggests utility, earthiness, woodiness and subtle richness. As it is the color of earth and is abundant in nature, brown is used in logos related to construction and development. It is also widely used in legal logos due to it simplicity and character. 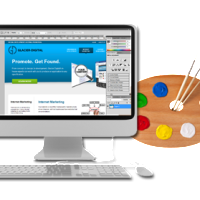 Website Color Psychology Conclusion By studying and mastering the above outline on color psychology, you can enjoy a major increase in the effective appearance of your website. Knowing what works best with your industry and how to attract the eye can make your website appear very professional, meaning that your relationship with customers will be that much stronger in the long run. Using color psychology in web design is great because it carries no cost. In addition, the simple addition of a little splash of color can transform your website from a dull source of information to a creative and attractive resource. In closing, you almost can’t afford not to employ color psychology when designing an effective website, meaning that mastering how website color psychology works can give you a significant competitive edge.